It works. Blueberries with your Thanksgiving feast. I swear! If you’re not much of a cranberry fan, then go for the little blue dynamos! If you LOVE blueberries, then just do it! You get that slight tartness with a little sweet, of course, but blueberries also work in savory dishes. Until yesterday, I had no idea that blueberries were so versatile. 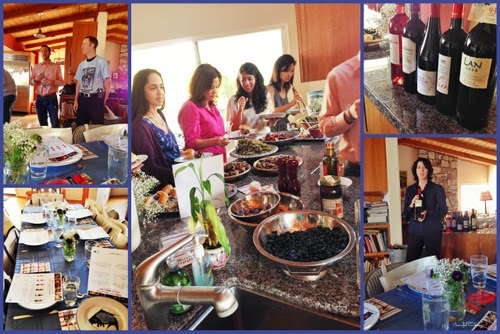 I attended A Very Blueberry Thanksgiving luncheon with Food Bloggers of Los Angeles, hosted by Erika of In Erika’s Kitchen, sponsored by Blueberry Council and Rioja Wines. Every dish had blueberries in it, from the appetizers to the main course and last but not least, the dessert. The courses were magnificently paired with 6 different Rioja Wine varieties. One thing that stuck in my head, as I listened to the Little Blue Dynamos guys talk about blueberries, was the quality of produce that comes from Chile. For some reason I have always thought that imported produce wasn’t as regulated as domestic. Well, Chile is an “export powerhouse” and in order to sustain that, they need to maintain a high level of quality and safety standards. Not just US standards but also Canadian, South Korean and European, just to name a few. What that means is the quality is just as good, if not better than what we get domestically. And since their harvesting time is opposite of ours (due to that south of the equator thing) we have the benefits of obtaining various fresh fruits during our winter months. Our Rioja Wine representative had so much to say (and I realize even more, how little I know about wine). I thoroughly enjoyed each selection that was presented (I even won a bottle!). Here’s a nice little tip: if you have a bottle of wine and the tannin is just a little too strong for you, place the bottle in the fridge for about 15 minutes or so and the flavor will soften and you’ll have a nice smooth wine to enjoy. If you follow me on Instagram (PeacefulCooking), twitter (ImStuffed) or facebook (Peaceful Cooking) you will have seen previews of the following amazingly delicious dishes on Sunday. All of which contained blueberries. Every single dish was fantastic. I’m going to share photos and links to the recipes since there are several, rather than make this post 2 miles longs (instead of just 1 mile). These little pop-in-your-mouth morsels were very good with that little crispy-crunch on the outside. But what made them beyond good, was the Blueberry “Not Ketchup”! Seriously people, you have to try it. It’s not too sweet, very smooth with a slight tang. If it were socially acceptable, I would’ve been eating the dip with those skewers once the potato balls was gone. It’s that good! Light, subtle flavors, not too thick or heavy. Just enough to keep you from fainting due to starvation while waiting for the big meal! (you know how it is….you don’t eat all day because you want to save your appetite) Adding the fun little dusting of blueberries gives this soup shooter that special festive touch. Sweet potato fans…here’s your chance to get out from under that sweet potato casserole! Healthy, quick and easy and look how beautiful that is. Talk about back to the basic with a new twist. Delish!! This is actually a great idea for turkey leftovers. Or maybe a little something to hold over those football fans until the feast is served. If you’re an early Thanksgiving Feast eater…then how about a quick bite before you go to bed. Whatever you choose, it’s gonna work. These are easy, delicious and fun to eat! If you struggle to find that vegetable side dish that can stand up to the main course, look no further! Brussels sprouts are roasted in a blueberry balsamic glaze yet they maintain their cabbage like integrity that so many enjoy. I’m sorry I didn’t get a picture of the turkey this was served with but we all know what that looks like. I went back for seconds and all that was left was a little of this salsa….and I was totally fine with that. The combination of blueberry, green apple, and red onions is phenomenal! If you’re going to skip the gravy, for whatever reason, then this is the perfect compliment for your turkey. What a way to end the day! This is truly a delightful dessert. It’s not heavy, it’s not too sweet. It doesn’t make you groan at the end as if you ate so much and wished you hadn’t. I should’ve brought some home though, because now as I’m looking at it, I really want some. It has all the right holiday spices and flavors rolled up in perfect harmony. If you’re looking to switch things up a bit, or introduce a new dish….maybe you have the privilege of enjoying more than one Thanksgiving dinner….the dishes above come highly recommended, by yours truly. Thank you Blueberry Council and Rioja Wines for sponsoring such a lovely spread. And Thank you again Erika for a wonderful afternoon, for your hospitality and your expertise in the kitchen! Cooking enthusiast and food blogger Danielle Nichols has a keen sense of adventure in the kitchen, always exploring new flavors and techniques. Her goal is to inspire others to expand their spice rack, stir up the pot and see where it leads them. Danielle launched “Peaceful Cooking” in 2009, is a regular contributor on Bakespace.com, has been a guest on Kitchen Party TV, and has two books published in Cookbook Cafe. Follow her on Facebook: Peaceful Cooking, Twitter: ImStuffed, Pinterest: ImStuffed and Instagram: PeacefulCooking. Danielle is married and the mother of two daughters.